Davis Hasselhoff will perform the National Anthem at Saturday's Pioneer Las Vegas Bowl. David "The Hoff" Hasselhoff, best known for his roles as Michael Knight in the original "Knight Rider" and Mitch Buchannon in "Baywatch," will serenade the sold-out Sam Boyd Stadium crowd this weekend with his rendition of the National Anthem. BYU and Arizona fans can hope it is as catchy as Hasselhoff's most recent single, "Jump in My Car," which topped European charts with more than 6 million downloads. Organizers of the 17th Las Vegas Bowl announced their selection Monday morning. To the Bowl Committee's credit, the Guinness Book of World Records does list "The Hoff" as the "most watched TV star in the world." Wait, it's Davis Hasselhoff??? I take it back....that was a bad hire. Get one of the infomercial hosts to sing the National Anthem before the magicJack St. Petersburg Bowl and I'll watch. On the contrary, I actually believe that there are a lot of bowl games worth watching this year, especially some of the earlier ones. And of course, there are the ones that aren't woth watching but I'll watch them anyway just because. I hope he performs as "eating burger off the floor" Hoff as opposed to "help bring down the Berlin Wall" Hoff. 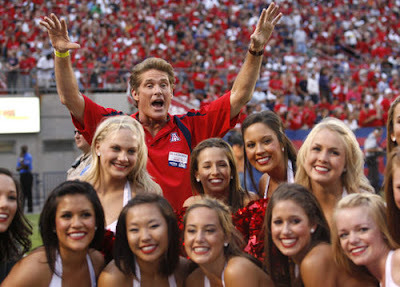 Hoff is an Arizona season ticket holder... Bear Down, Hoff! We'd rather see The Hoff do this. What part of Germany is Las Vegas in? Far, far West Germany, Mal. Just read that it snowed in Vegas today.....yup, that's right, hell has officially frozen over.